Our ProcessPV cells made with Silicor’s solar silicon regularly achieve in-line conversion efficiencies greater than 17 percent—at roughly half the production cost. Here’s an in-depth look at our process, and how we’re different than the status quo. 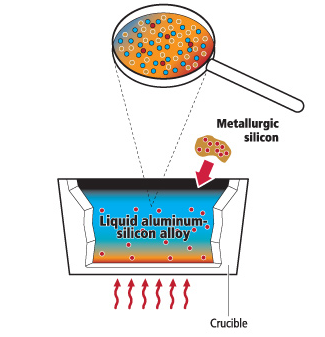 Metallurgical-grade silicon—with impurities such as boron and phosphorous—is dissolved in an aluminum smelt at a temperature of nearly 800⁰ C. This material has a purity of 97% or higher. 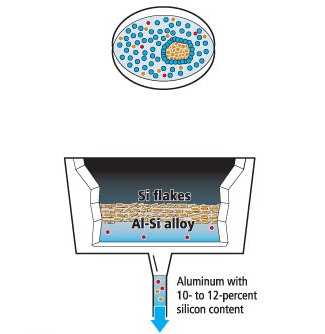 As the liquid aluminum-silicon alloy crystallizes, the silicon hardens into flakes. The impurities remain in the aluminum, which represents the first stage in the purification process. Notice how the silicon has been “drawn” together and has an aluminum coating. The mixture cools, and the silicon solidifies. The liquid aluminum is then poured out. 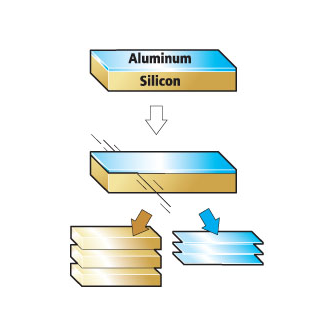 Because the aluminum now contains traces of silicon, it can be used as an aluminum-based master alloy. 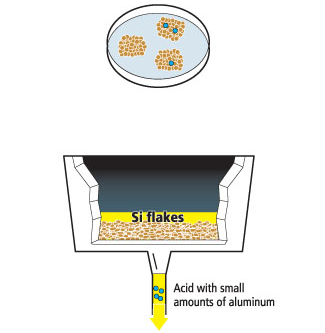 Acid is poured onto the silicon flakes to remove the remaining layer of aluminum. 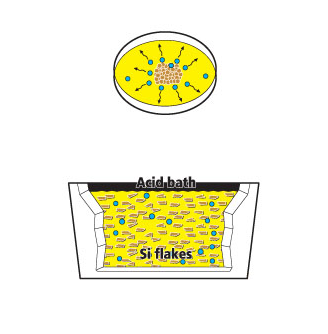 In the acid bath, the aluminum layer separates from the surface of the silicon flakes; this provides an additional layer of purification. The bath is drained. The liquid—polyaluminum chloride—is used commercially by wastewater treatment facilities. 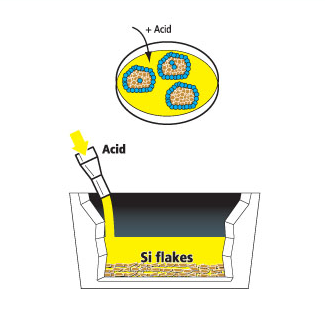 The remaining silicon flakes, which still contain traces of aluminum, are melted. The heat causes the remaining aluminum atoms to separate and migrate to the surface. 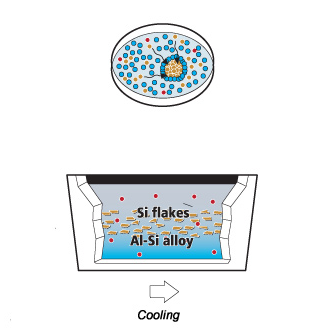 The combination of aluminum and silicon cools. The remaining aluminum atoms form a thin layer on the surface. 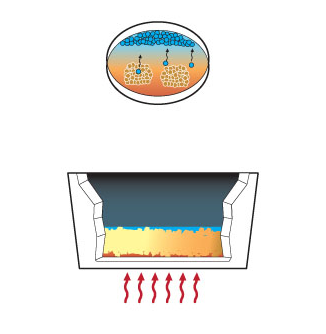 Removing this layer from the silicon is the final purification stage, and the resulting material is solar silicon.